Work Package 1: Project Management : This work package aims at realizing the administrative activities in the project. Project management will be realized by the steering committee. Steering committee is formed by the representatives of project leader, country coordinators and work package leaders. There is one task under this work package. This work package aims at defining the scenarios, literature analysis on the state-of-the-art, identifying system level and functional requirements. There are three tasks under this work package. (i) State of the Art Analysis, (ii) Scenarios Definitions, and (iii) Requirements and Specifications. This work package aims at defining the architecture of the PARFAIT platform. Architecture studies will cover defining the glossary, a domain model specification and component level architecture design. There are 3 tasks under this work package: (i) Architecture Requirements, (ii) Reference Architecture Design, and (iii) Toolkit and Framework Design. This work package aims at implementing the components, library elements, toolkits and thematic frameworks. There are 2 tasks under this work package: (i) Implementation of Toolkit and Library Elements, and (ii) Implementation of Thematic Frameworks. This work package aims at implementing the applications on top of the thematic frameworks. Test planning, integration and validation of the applications will also be realized in this work package. There are 3 tasks under this work package: (i) Application and Demonstrator Definitions, (ii) Implementation of Demonstrators and Applications, and finaly (iii) Testing and Validation. This work package aims at realizing the dissemination activities, identifying business models and run exploitation activities, defining policies and contributing to standardization activities through recommendations. 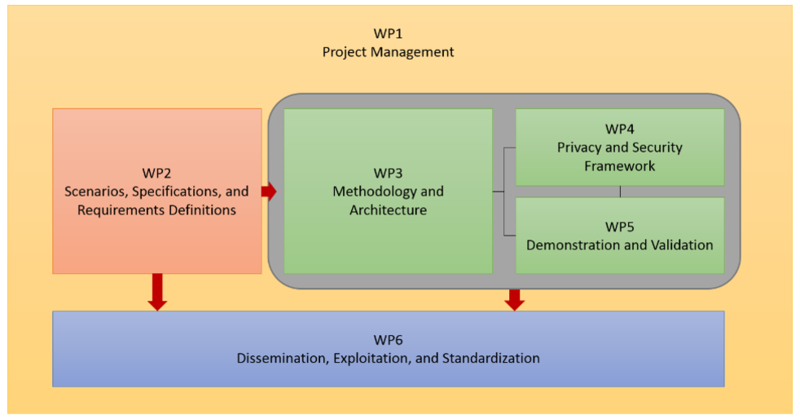 There are 3 tasks under this work package: (i)Dissemination, (ii) Exploitation Plan, and (iii) Standardisation.